Meat and Potatoes: 2.0 | Food E.
Some things are better with mustard: ham and swiss, a ballpark hot dog, your sworn enemy’s favorite white silk blouse… Kidding. Promise. When I stumbled across this recipe, I was smitten. As I mentioned, I’m a texture girl myself and this recipe is FULL of amazing textures. I complemented the steak with a simple warm potato salad, and there were clean plates all around. Warmed my little Food E. heart. Stir together mustards, brown sugar, pepper, and lemon zest. Pat beef dry and season generously on both sides with salt. Heat oil in a heavy skillet over moderately high heat until just beginning to smoke, then brown beef for around 2 minutes on each side. Transfer to a shallow baking pan that has been coated in oil. Pour mustard mixture over the top of the meat so it is completely covered. Roast beef in the oven for 30-35 minutes for medium-rare (NOTE: my cut of beef was about 1 1/2 inches thick; if yours is any thicker or thinner add or subtract a few minutes accordingly). Remove from oven and let sit for 45 minutes. (Why, you ask? See here). Place onion slices in a bowl and cover with cold water. Allow to soak for 30 minutes. Cook beans in boiling salted water until bright green and slightly tender, about 5 minutes. Drain beans in a colander and rinse under cold water to stop cooking, then transfer to a large bowl. Add arugula to beans. Drain onion slices and pat dry. Whisk together vinegar, lemon juice, mustard, and salt and pepper to taste. Add oil in a slow stream, whisking until completely incorporated, about 3 minutes. Cut beef into thin slices, cutting against the grain of the meat at a 45 degree angle. 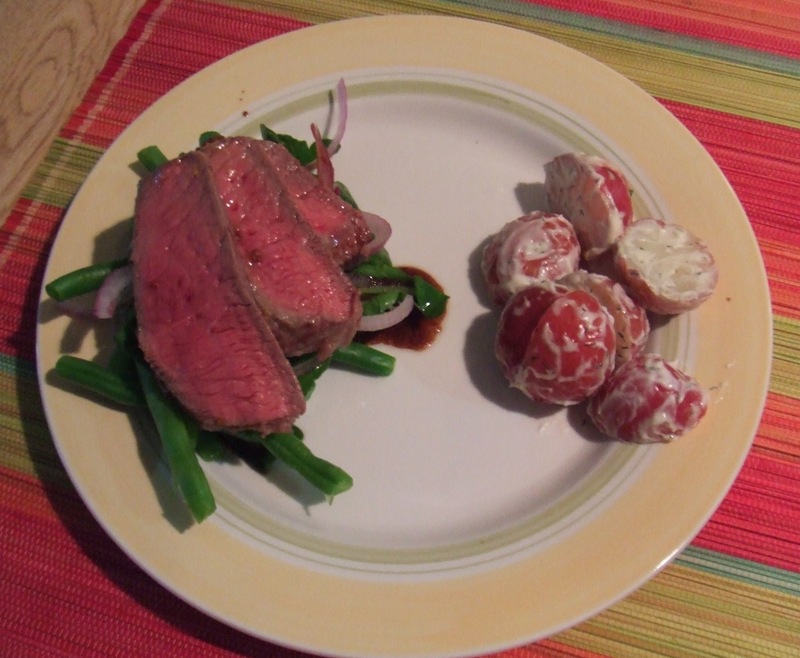 Plate salad in layers: arugula, green beans, red onion slices, a Tbsp or so of dressing, and then beef slices. Boil potatoes for around 20 minutes, until you can stick a fork in and it pulls out easily. Drain water from potatoes and let cool for 10 minutes. Cut potatoes in half and toss with mayo, dill, and salt and pepper. Serve warm alongside steak. The brilliance of this meal is in the leftovers. You can slice up whatever beef is leftover, wrap it in foil, and stick it in the fridge. Separately wrap up the salad remainders, the potato salad, and the dressing and serve it all cold the following day. The flavor of the mustard will only marinate in the beef even more and that, my friends, is a good thing.